“ I cannot promise you happiness in this life; only in the next”, said Our Lady to the little girl named Bernadette. The young girl lives out her life quietly, going to a convent and never seeking attention for herself. She gave all of herself to God and became a great saint. Her body is incorrupt and it looks so beautiful as if she is only sleeping. It is a marvel! The first apparition occurred February 11, 1858. There were eighteen in all; the last took place July 16, of the same year. Bernadette often fell into an ecstasy during these apparitions, as was witnessed by the hundreds who attended the later visions, though no one except Bernadette ever saw or heard the apparition. The mysterious vision Bernadette saw in the hollow of the rock Massabielle, where she and friends had gone to gather firewood, was that of a young and beautiful lady. “Lovelier than I have ever seen” said the child. She described the Lady as clothed in white, with a blue ribbon sash and a Rosary handing from her right arm. Now and then the apparition spoke to Bernadette. One day, the Lady told the girl to drink of a mysterious fountain within the grotto itself, the existence of which was unknown, and of which there was no sign. But Bernadette scratched at the ground, and a spring immediately bubbled up and soon gushed forth. On another occasion the apparition bade Bernadette go and tell the priests she wished a chapel to be built on the spot and processions to be made to the grotto. At first the clergy were incredulous. The priest said he would not believe it unless the apparition gave Bernadette her name. After another apparition, Bernadette reported that the Lady told her, “I am the Immaculate Conception”. Though the girl was unfamiliar with the term, the Pope had declared the doctrine of the immaculate conception of the Virgin Mary in 1854. 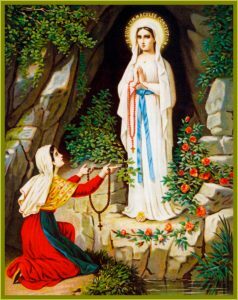 Four years after Bernadette’s visions, in 1862, the bishop of the diocese declared the faithful “justified in believing the reality of the apparition” of Our Lady. If you have never seen the movie “The Song of Bernadette” from the 1940s, I recommend you do so. It can be rented. It was made by a Jewish man who made a promise to Our Lady at Lourdes that if he would survive and escape the horrors of WWII Europe, he would tell the story of St. Bernadette and Our Lady of Lourdes. He did survive and he kept his promise and the Oscar winning movie was made. This is a video that you never forget.